Custom Rectangle Flags | Feather Flag Nation | Get One Today! Feather Flag Nation has been in the business of designing and printing indoor and outdoor flags for business advertising for over 10 years. We are experts in our field. You won’t find a better quality banner flag at a better price anywhere, guaranteed. Our rectangle flags are great for anyone looking for a change in style for their outdoor advertising flags. These flags allows more design real estate by being 3 feet wide and of a rectangle shape. Recommended size for outdoor use would be our 15 and 12 foot kits. The “L” shaped pole kit setup allow these custom banners to always be open, making your message always visible. Our custom rectangle flags are made of a strong polyknit mesh material. The flags are hemmed all around with a 2” sleeve on the top and left side of the banner. Sleeves can be either black or white. Print process is digital, therefore you are not restricted to 3 to 5 color prints. Use live images, gradients, rainbows, tye-dye colors, or anything else you like. No restrictions, no gimmicks, no set-up fees. Just a flat price per product + shipping. Heck, we even offer shipping for free on specific sale days. Advertising flags for business attract customers and increase sales, sometimes as much as 20%. You are certain to get a solid return on your investment when you use our flags for business advertising. 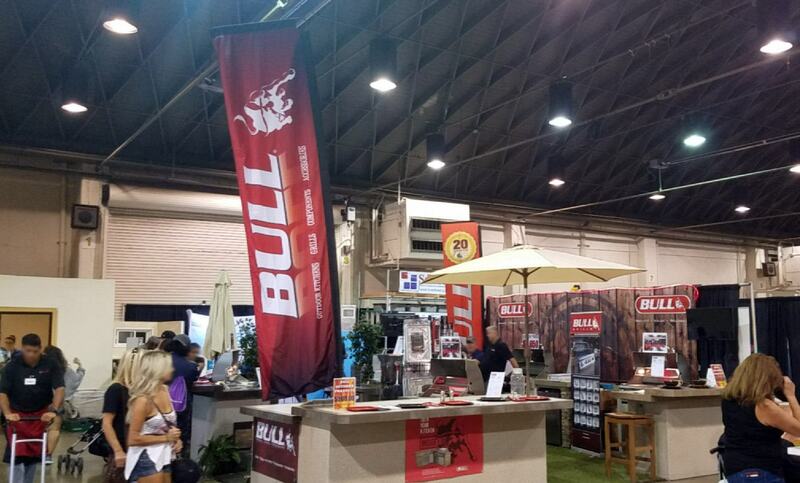 Our products are perfect for trade show displays, real estate brokers, and car dealerships. Regardless of your location or your business, Feather Flag Nation has a product for you. Banners and signs from Feather Flag Nation will help your business stand out from the crowd. Your success is our success. We stand by our product and our customers universally agree. Don’t let another day go by; contact us today to get started attracting the attention your business deserves. 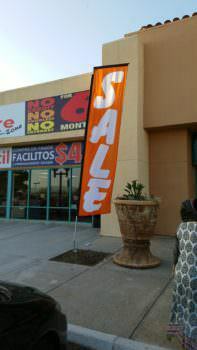 Sale Rectangle Flag mounted into a small dirt area in front of a furniture store. We also have a large variety of low-cost and high quality stock feather flags and banner flags. They are in stock and ready to ship. Most of our orders ship the same day if the order is place before noon. These amazing and colorful stock feather flags can increase your sales by up to 20%. Find the flag that fits your business and start making more money now. Contact us for more info about custom flags. Our stock and custom outdoor advertising products will attract more costumers to your business and generate more sales.